Welcome back to Daniel Sloane-Suarez’s MLS adventure in charge of FC Dallas. In the previous update, we secured the MLS Supporters’ Shield by finishing the season at the top of the table during the regular season. 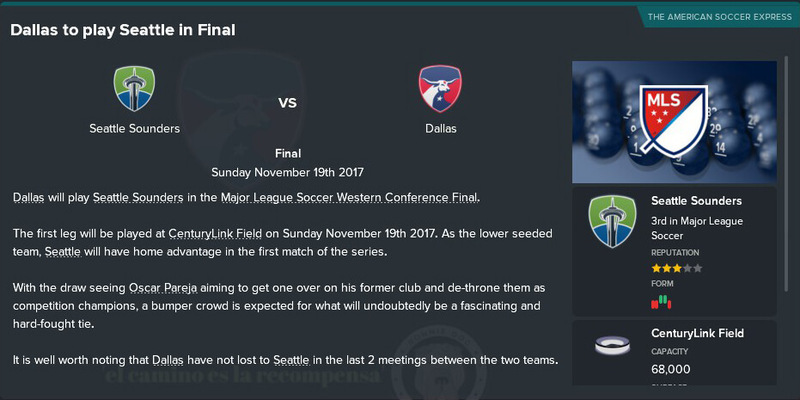 In this update, we’re going to take part in the post-season playoff run to win the MLS Cup and be crowned the champions of the 2017 MLS season. If you’re new to the series, you can find part one here. If you just need a quick refresher, here’s a link to the previous update. As I said in the previous update, the Supporters’ Shield is a major award for the season, and it awards the winning US-based team a berth in the Champions League, but the most important award is the MLS Cup, which is contested at the end of the playoff run, similar to the Super Bowl for the American National Football League. At the end of the season, the top six teams in each season enter into a Western Conference Playoff and an Eastern Conference Playoff, which will determine who from each conference will contest the MLS Final. There are three rounds to this one, with the “seeding” for each round based on your position in the individual conference table, not the combined Supporters’ Shield table. The top team two teams in each conference have a bye all the way to the semi-final and skip the first round. The East and West conferences follow the same format, by the way, so regardless of who you manage, this guide is accurate, aside from who you may face based on the conference you’re in. In the first round, the third-placed team faces the sixth-placed team and the fourth-placed team faces the fifth-placed team in a single match to advance into the semi-finals. In the conference semi-finals, the first-placed team will play the lowest-remained placed team, and the second-placed team plays the second-lowest placed team in a two-legged aggregated series, with the winners from both matches advancing to the conference final. The conference final is also a two-legged series, and the winner of that series advances to the main MLS Cup final to play against the winner from the other conference in a single match. This match is hosted by the team with the better record during the season of the two, and whoever wins this match will win the MLS Cup and be crowned the league champions, which is also worth a Champions League berth. If a Canadian team wins either the Supporters’ Shield or the MLS Cup, the next highest ranked US-based team in both events will be awarded that Champions League berth. Since Toronto FC, Vancouver Whitecaps FC, and Montreal Impact are based out of Canada, their only opportunity for Champions League soccer comes from winning the Canadian Championship, a cup competition for teams based out of various Canadian divisions. The winner of that cup gets the only Champions League slot allocated to Canada. 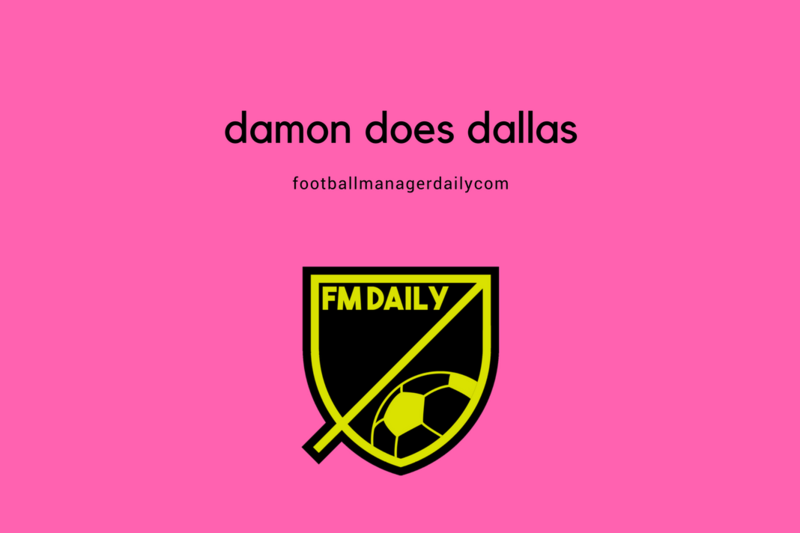 Now that this overview is out of the way, we need to step into my Football Manager save so I can show you how everything worked out for FC Dallas. As the winners of the MLS Supporters’ Shield and therefore the top team in our conference, we’ve got a bye into the next round. The Wild Card is the first round of the playoffs, with those lower-placed teams that I described above determining who of them can go to the semi-final. Of the teams who advanced to the next round, we were paired off in the two-legged semi-final against Los Angeles Galaxy. The first match was a 0-0 draw in Los Angeles, so there’s not really anything worth sharing. The second round was a 4-0 home victory in Frisco at our home ground. Tesho Akindele and Ainsley Maitland-Niles, on loan from Arsenal, scored in the first half, and Akindele scored twice more in the second half to give us a commanding victory over the Galaxy to advance into the conference finals. We were drawn against the Seattle Sounders for the Final, with the first match being played on the road in Seattle. I’d like to say with enthusiasm that we advanced to the final, but it’s sad to say that here was where we fell on our faces. In the first match, Seattle took full advantage of being at home in front of a massive crowd, and we were soundly defeated 4-0 while fielding a team without the likes of Maxi Urruti, who was out on injury with broken ribs, and several key players who joined up with their national teams for the mid-November break. 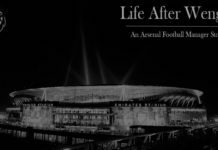 At a time when we needed good results, we had a couple of injuries and a national break strip us of our strongest playing squad, and we paid the price for it. In the second match, we had the players back from break and we took full advantage of being at home with 9 of our best players on the field, but the end result only came out to 4-2 in our favor, meaning we lost the Conference Final 6-4 on aggregate, leaving Seattle to advance into the MLS Final against Toronto FC. Seattle would visit Toronto for this match, and they would ultimately lose to the Canadians 2-1. The 2017 MLS Champions are Toronto FC this year, though the Champions League berth given to the winner had to fall on Seattle because as I said, a Canadian team is not eligible for a US-based Champions League berth. This has been a long update, but bear with me, because there’s one more MLS event I want to cover that happened shortly after the final, but it might be too short to push another update for. When the league is expanded and a new team joins, there’s an “Expansion Draft”. In this draft, each team lists 11 players who are safe from participating in the draft, and each expansion team joining the league gets to participate in 5 rounds to pick one player per team to add to their rosters. 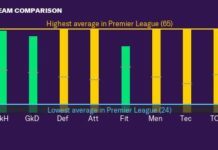 Once a player is picked from a team, the remainder of that team’s players will return to their original clubs, which prevents the teams from relying heavily on one team’s roster and depleting them too badly. This draft is a hard-coded event in the game, and in FM18 it will happen only one time, at the end of the 2017 season, for Los Angeles FC, who join the league in 2018. I’m not going to show you the draft screen, because it’s the same as the one you saw in the last update. The only difference is that only LAFC will be listed on the top as participating. With the expansion draft coming up, we need to pick our 11 players we want to keep. Bear in mind that all homegrown players (the ones you sign directly from your youth academy) are automatically listed as protected players and can’t be traded. This means players like our starting goalkeeper Jessie Gonzalez, our reserve goalkeeper Eduardo Cortez, and our teenage strikers Jesus Ferreira and Bryan Reynolds are automatically part of the 11 man list. That’s 1, 2, 3, and 4 from our list instantly occupied. As far as the players I want to keep going, Maxi Urruti, Cristian Colman, and Tesho Akindele are naturally safe, with over 20 goals each during the season and they have gelled as an outstanding strike partnership. I don’t see any need to disrupt that with new blood, and I certainly don’t want them competing in the same league against me if I can help it. That makes 5, 6, and 7. Michael Barrios, our rotation striker and midfield option, has been a regular in the team, especially after Gruezo’s departure to PSG, and he’s got plenty of goals of his own from the midfield. He’s a great link-up from the back line to the attacking front, so he’s going to be number 8 on my list. The same goes for Mauro Diaz, who barring a couple of minor injuries has been just as effective in the midfield. He’s number 9. Kellyn Acosta is an FC Dallas product, and despite not being a natural wingback, he’s done the job well enough, and I’d like to keep developing my own team’s younger kids to their potential, so I want to save him as number 10. That leaves one spot left and a couple of players I’d like to keep in a perfect world. FC Dallas defender and captain Matt Hedges, his partner in the back Walker Zimmerman, and Maynor Figueroa are three players who would all be kept in a perfect world, and there are another couple of players I can choose to keep or not keep. Jacori Hayes is a young midfielder with not a lot of potential. I’ve kept him around as a backup option, but if he’s up for the draft and leaves, I won’t miss him. He’s not going to be protected. Renatinho was brought in on a trade for a Super Draft spot from Columbus Crew, and while he’s been a decent and fairly regular member of the team, he’s not likely to improve much and I’m already eyeballing some better options to sign in the offseason, so he’s not protected. Atiba Harris is up there in years and I plan on phasing him out, despite him being a great member of the team so far, so if he wants to be taken out, I won’t care, since he’s a backup option these days. Between Hedges, Zimmerman, and Figueroa, I’ve opted to keep our captain Matt Hedges. He’s had the better performances for the year, and there’s no one I can think of off-hand who would be as capable in the defence or as a leader for the team, so he’s given the pick, leaving Zimmerman and Figueroa open to being drafted. LAFC have been interested in Zimmerman the entire season, and since I didn’t have enough protected slots to keep him, he ended up going into the 5-round draft and was LAFC’s first draft pick. He’s a great defender, and he’s worth over a million dollars, so if he went up for sale, there are probably a couple of teams who would be interested in a bid on him, so it’s not a surprise that he’s turning out for Los Angeles next season as a first-round pick. It’s a steal, really! It’s been a bit of a lengthy update, so it’s time to run. At the end of December we’re supposed to have our youth intake, and then in early January, we’ll have our SuperDraft before the preseason starts. I’ll make a special post just to cover the youth intake and we’ll go over the MLS combines, the SuperDraft, and we’ll look at some of the promising youngsters that want to attempt to join Major League Soccer and go pro. 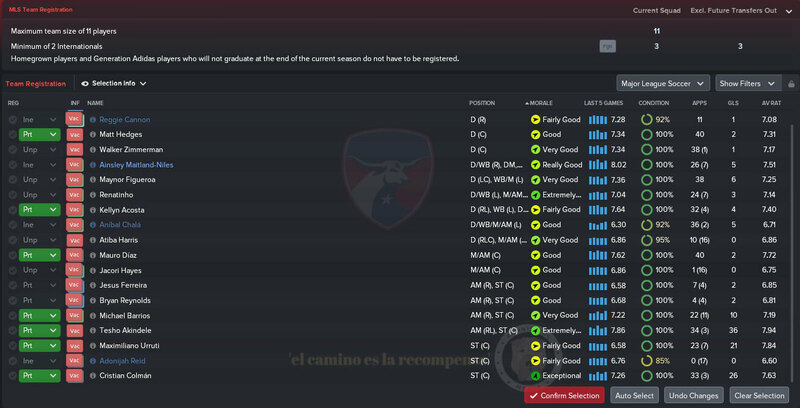 I’m a 25-year-old American who has been playing since Football Manager 2014. FC Dallas from the MLS is my home team that I support, follow me on Twitter.